In the night of 30th November at 8pm, as the neighbourhood of Sant Andreu (Barcelona) was in the middle of a celebration and patrols were going around, a cash machine of Deutsche Bank was happily burning. A piece of writing, ‘prisoners of war’. Coherent consequence of my anarchist orientation. Let the flames lighten up my comrades’ nights, even if only with a simple smile. To the prisoners of war in the Spanish peninsula. Onwards, comrades! To the Italians persecuted in the operations panico and scripta manent. To Paska, a comrade on hunger strike since 5th November. Strength to you, comrade! To Anahi, in coma following an attack in Argentina. Resist, comrade! To Hugo and Marcos, rebels and avengers. Onwards! To the Greek and Chilean warriors. To Lisa, I’m waiting for you with a complicit smile. To all the coherent and consequent individuals. Let’s continue the struggle! To the compas in Madrid. Let M.I.L. cash machines burn! Translated from Italian by act for freedom now! The first Saturday after the comrade’s transfer, concentration in front of Wad Ras. Stay tuned for new information that may be coming!! On the night of January 28, we burned two vehicles of the company Prosegur near their headquarters in the Bellvitge neighborhood of Hospitalet. We do not think it necessary to justify this attack on these wretched guard dogs. To carry out this action we have resorted to an old, well known method used by anarchists. The device consists of a small bottle filled with gasoline, a wick with some matches around it. We want with this little gesture to send all our love and strength to the anarchists accused of having expropriated a bank in Aachen and who have been on trial since January 23rd. Tuesday, June 21 at dawn, the Mossos d’Esquadra Corps [Catalan Police] kicked down the door of the house of an anarchist comrade of Barcelona, where he lived with his companion and other housemates. All were awakened by guns pointed on them and were handcuffed for hours while police raided and devastated the home, located in the neighbourhood del Eixample. Eventually, the comrade was arrested and transferred to Madrid, where the National Court ordered his detention on the basis of a European arrest warrant issued by the prosecutor of Aachen, accusing him of having participated in the expropriation of a branch of Pax Bank that took place in November 2014. It is for this same action that the comrade arrested on April 13 in Carmel is also in prison. In this case, however, the police decided not to use the staging and media spectacle it had used during the April operation, not issuing any press release and not notifying the media of the operation. On 13th April 2016 the Mossos d’Esquadra in collaboration with the German police raided three places, two of which were private homes and one was the squat Blokes Fantasma. The repressive operation concluded with the arrest of our comrade, for whom there was a European arrest warrant after Germany accused her of participating in a bank expropriation in the country in 2014. The comrade has been held in solitary confinement in the prison of Soto del Real (Madrid) since 14th April and has expressed her opposition to being extradited; but judge Angela Murillo of the fourth section of the Audiencia Nacional gave in (as usual) to the request of the German state and on 26th May she ordered our comrade to be extradited within 10 days, after which she’ll be put in a maximum security prison. The prosecutor in Aachen (Germany) is the same one that issued a European arrest warrant on 24th June 2015 against a Dutch anarchist comrade, who was arrested on the Greek-Bulgarian border and imprisoned for two months. On Wednesday April 13 at 5am an operation of the Mossos d’Esquadra [Catalan Police] began in which two private homes and a squat in the neighbourhood of La Salut, the “Blokes Fantasma” were raided and the twenty or so people living in the building were detained for twelve hours. In addition to the looting and destruction that accompanies any police search, the operation resulted in the arrest of a comrade who had already been imprisoned within the framework of the Pandora Operation, and for whom since 11 April there was a European arrest warrant on charges of participation in bank expropriations in Germany. After her transfer to the Spanish National Court, judge Eloy Velasco ordered preventive detention for our comrade, who has been transferred to the prison of Soto del Real. After the recent police operations against anarchist milieus, so much has been written and said; statements and opinions mainly denounce or ‘condemn’ the repression inflicted by the authorities. After the latest repressive operation and the reactions that followed, we reckon we should give our point of view. Starting from the fact that the ongoing repression is the State’s logical response to those who consider themselves (or the State considers) its enemies, we don’t understand certain communiqués full of victimization, where in practice (and with the most appropriate words, of course) they beg the State to stop unleashing its cops ‘indiscriminately’ against anarchists. And they say that repression is unjustifiable, and of course they use and abuse the word ‘frame-up’, and say we do nothing wrong, and that they attack us because we ‘think in a different way’… They try to give a picture of ‘normality’ and endeavour with all means to make this picture clean and socially acceptable. They do their best to take distance from violent words and actions; and as they become entrapped in the game of power and use the latter’s language, they make distinctions between ‘good’ anarchists and ‘bad’ ones, thus promoting criminalization from within their ranks. At this point some of these ‘anarchists’ don’t feel ashamed at giving pitiful interviews to the media, and what is worse they pose as spokespersons of the ‘anarchist movement’ (and then of all social movements); these would-be politicians and leaders of the masses try their best to alienate anarchism from its subversive and conflictual character, and present anarchism as a simple movement of activists, deprived of any words or actions that clash against power and the established order. But spreading fear leads to panic and paranoia, and in turn this leads to discouraging speeches calling for inaction, maintaining that ‘to behave’ is better for both oneself and other comrades so as not to be the objects of police investigations. To conclude this topic it must be said that even if the State has shown us nothing more than the tip of the iceberg, this is nothing compared to what could happen; in fact it’s sufficient to look at repression currently occurring in other areas of the world (and not even that far) or in the Spanish State itself a few decades ago. It should be clear that as we stand as anarchists we live with the risk and possibility to be hit by the machine of repression, also at the margins of our practices, because, as we’ve seen, there are times when the same repressive machine tries to stir fear among the enemies and strikes everyone rather than inflict targeted blows; as a consequence anyone of us can be a target. Although the Spanish state prefers not to make claims known so that actions are silenced, we know for certain what’s happening, with more or less frequency. The violence of the minority will continue, and we talk about violence openly and without troubles because we are convinced that power won’t fall by itself, nor will any Messiah come from heaven with a solution. We don’t use words such as ‘self-defence’ or ‘counter-violence’; nor do we talk of anarchist violence only in a context of mass uprising when it’s more acceptable. We’ve found out that in spite of everything, insurrectional practices and attacks are still possible; police can’t be everywhere, they don’t spy on us all or control us all, some common sense, good planning and good will are more than enough to prove that the picture of a controlled and pre-arranged world is just an illusion; it’s up to us to break this illusion of tranquility. For in the face of the blows of power and the misery of some ‘anarchists’ who only care to give an image of good innocent boys to society in order to be safe, we arm our desires and passions, and go on the attack. To the masses and their inactivity we offer our aggressiveness, we expect nothing and throw ourselves into constant anarchist revolt. We are the rebels who have decided to carry on and run the risk, and dare live anarchy here and now. Words without action are dead words to us, so we take the occasion of this communiqué to claim the following actions carried out in several neighbourhoods in Barcelona: the fire on vehicles of security companies, private ones as well as State-owned ones; attacks on bank branches through damages to windows and ATMs caused by hammers, stones, paint and fire; fire and destruction of urban structures. With this communiqué we want to give our warm greetings to our prisoners, especially Monica and Francisco, who have been in pre-trial detention for over two years always with their heads held high; to comrades Nicola and Alfredo, the comrades of the CCF and the comrades imprisoned in Chile; and we want to remember our fallen ones and greet those who day by day continue to bet on constant conflict and anarchist insurrection, and make anarchy be once again a threat. For a Black December everywhere! For the black international of the anarchists of action! For the spreading of chaos and Anarchy! An “anti-repression” demonstration brought together nearly 500 people this Saturday, June 13, 2015 in Barcelona under the slogan “if they attack us for our struggles, we will respond with struggle,” it was called in solidarity with incarcerated and persecuted comrades following operations ‘Piñata’ (two are still detained, three others released under judicial control) and ‘Pandora’ and more generally against the repression of squats, and those who struggle against the state and this society. On June 1 we got the great news that three of the five comrades being held in preventive detention, accused of being part of a terrorist group under Operation Piñata (including one who was already arrested and imprisoned in Operation Pandora) are being released without bail. They still have all their charges and have to sign in frequently at court, and two of them are prohibited from leaving the country. Operation Pandora was launched in December in Catalunya, and Operation Piñata on March 30 all across the Spanish state but focused in Madrid. The operations resulted in the arrests of 26 anarchist comrades (plus the arrests of over a dozen more for resisting the raid on a social center) on anti-terrorism charges, the raids of dozens of houses and social centers, the theft of cash, and the seizure of computers, harddrives, phones, etc. This morning in Operation Piñata (following Pandora in December) cops have raided social centres and arrested people (at least 26) in Barcelona, Madrid, Palencia and Granada. La 13-14 in Madrid announced it was being raided this morning. 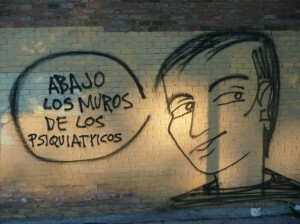 CSOA La Redonda in Granada released a communique condemning the raids, which they said occurred without a warrant. Other raided social centres were la Magdalena and La Enredadera de Tetuán. At least 15 people were arrested during raids in Spain on December 17th for being part of an “anarchist terror organization” in what the Spanish government is calling ‪#‎OperacionPandora‬. At quarter past five, an operation consisting of Mossos d’Esquadra mobilized to carry out an operation against the Libertario movement. 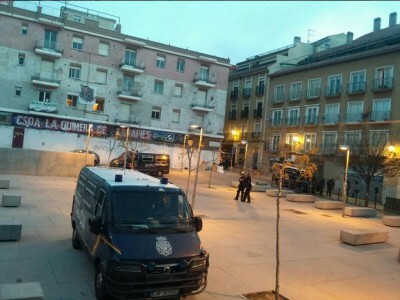 So far, the Mossos have raided the Kasa de la Montanya, the Libertarian Ateneo de Sant Andreu, the Anarchist Ateneo de Poble Sec and several private homes. On orders from the Spanish National Court, in an operation ordered by Judge Javier Gómez Bermúdez, the agents have raided the Kasa de la Muntanya, a squat which this year celebrates twenty five years of occupation. They busted the main entrance of the house to gain access while a police helicopter with spotlights hovered over the building. The twenty inhabitants of the house had to retreat into the gym whilst the police forced entry into the building. At the time of the police raid, the building had two children aged five and six years. The Mossos separated one of the kids from his father on the ground floor. The police confiscated all mobile phones, laptops and computer devices that were found on the premises. Agents seized all types of documentation, while numerous electric home workshop tools were also confiscated in order to help the police construct their narrative. About fifty people installed a roadblock on Travessera de Dalt, in a spontaneous act of solidarity with the Kasa de la Muntanya, until riot police dispersed them a few minutes after eight o’clock. Subsequently the solidarity group moved to the Plaza Lesseps and called for more protests. From the outside of the house located in the neighborhood of Gràcia district Salut, witnesses heard several firecrackers and said they could see in lights of several flashlights inside the building. The police operation is made ​​up of agents from the Information Division of the Mossos d’Esquadra, accompanied by a large number of members of the Mobile Brigade which, among other tasks, formed a perimeter around the whole area and denied any access to the home. ¡¡¡SOLIDARIDAD INTERNACIONALISTA E INSURRECTA CON LXS COMPAÑERXS EN PRISIÓN.!!! 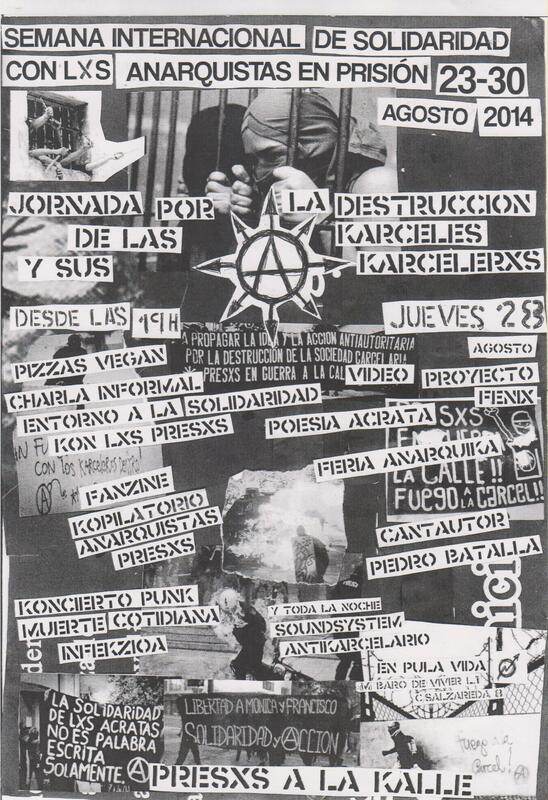 El Jueves 28 en Karcelona…. [December 22, 2013] in the early hours of last week, group of people attacked police station with paint bombs and smoke bombs in AMSTERDAM. This modest action is in solidarity with Monica and Francisco and to all comrades in prison.